Explore New York City from all angles on this ultimate, all-access, city exploration tour. Experience the rich culture of the Big Apple's historic melting pot at great landmark locations like the Empire State Building, the Statue of Liberty, Wall Street, Times Square, and much more. Snap pictures on a downtown double-decker bus tour. And indulge in the panoramic view of the city skyline from a cruise around the Statue of Liberty. 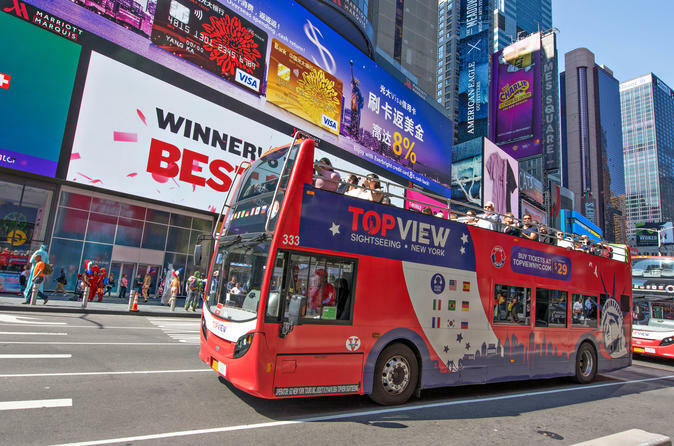 Hop on and off a double-decker bus tour to see all the major attractions in the Big Apple. Narrated by an automated guide system, this sightseeing tour of New York City’s popular downtown neighborhoods will both impress and amuse as it maneuvers past historic landmark locations like Rockefeller Center, Times Square, the Empire State Building, the Flatiron District, Greenwich Village, Manhattan's NoHo and SoHo, Little Italy, St. Paul’s Chapel, Freedom Tower and the World Trade Center site, Wall Street, Battery Park, the United Nations Headquarters, and more. Additionally, take up to 24 hours to explore the city in other ways. Add a cruise around Ellis Island and the Statue of Liberty, with an unforgettable, panoramic view of the New York City skyline. It's the perfect, comprehensive tour of New York City in only one day.